On Monday night I gave evidence at the Performance and Contract management working group which is undertaking a 3 year review of the Capita CSG contract. One of the areas I covered was the increasing cost of the Capita contract specifically in areas such as special projects and contract variations. This shows that we have spend £33.44 million more on the CSG contract than was originally envisaged. (It doesn't include the spending on the other Capita contract, Re). I was encouraged to hear Cllr Zinkin say that this was an area they were looking into having heard my concern expressed about this previously. However, yesterday the supplier payments for June were published and guess who was a massive recipient? Yes Capita! On the two contracts, CSG and Re, Capita were paid £17.5 million in June so, by the looks of it, a lot more special projects and contract variations. In terms of Capita's performance, I also submitted some charts on telephone performance over the last 12 month. Whilst the average figures say they are meeting the target of answering calls within 20 seconds, I like to look into the detail of the figures. Some calls are automated where you say the name of the person you want to speak to and these calls are all classified as meeting the service level target at 100%. 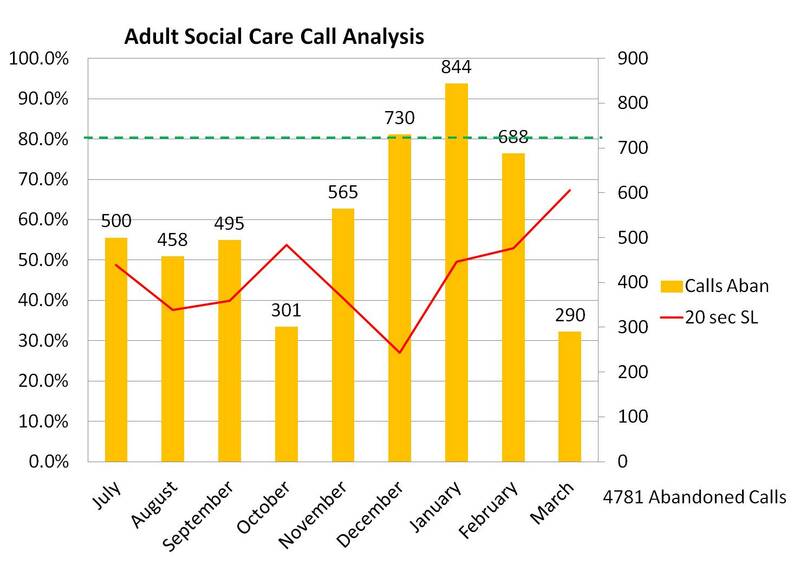 However, this offsets some poor performance on other calls.The charts below are for three specific service areas and shows, on a monthly basis, what percentage of calls are answered within the agreed target and how many calls are abandoned - that is residents give up after waiting too long for their call to be answered. 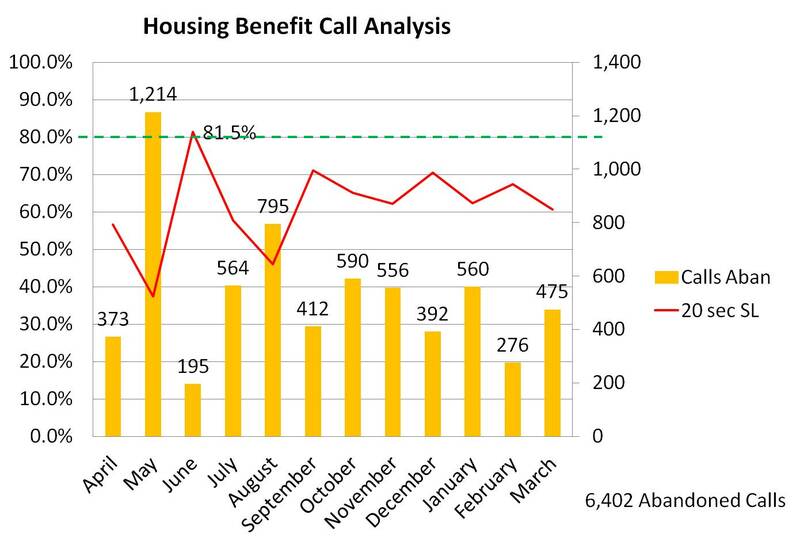 This shows that over the last year calls to Housing Benefit have only been answered within the agreed service level target once and that over the year more than 6,400 calls have been abandoned. Calls regarding Council Tax have only hit the agreed service level target twice in the last year and more than 8000 calls have been abandoned. Finally, in terms of Adult Social Care, the 20 second target is never hit and almost 4,800 calls were abandoned. That is exceptionally worrying but worse, I seem to be the only person who is highlighting this problem. 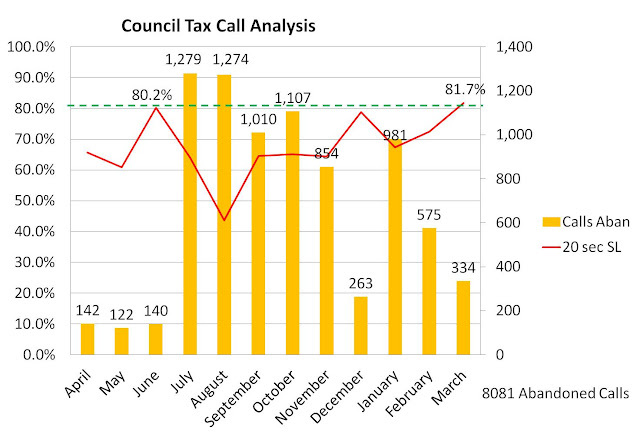 (Calls for April, May and June were not recorded in the performance figures). I made the point to the working group that staff turnover and the failure to retain staff is a major contributing factor to both meeting these targets and to ensuring residents are getting the best quality service from knowledgeable and experienced staff. This runs throughout the contracts not just on answering telephones yet Barnet do not measure Capita against staff turnover Key Performance Indicators (KPIs), something which I hope they will address as part of this review. I have also submitted my evidence on the 324 contractual commitments that were made by Capita which you can read (or not) here and have asked the working group to make sure that someone actually checks to see if they have been honoured. I hope that the working group really scrutinise the CSG contract performance and, as I said at the meeting, several hundred hard working Barnet Council employees were made redundant to implement this contract. We owe it to those people to at least check that the promises made are being delivered. Set out below is a guest blog from the residents of Weirdale and Asbourne Avenue next to the North London Business Park. "The London Borough of Barnet are on a mission, to build on every conceivable piece of land including back gardens with little thought or consideration to local residents, the infrastructure, environment or the community it serves. This is not a new strategy but it is strategy about to go in to overdrive with the proposed redevelopment of the North London Business Park (NLBP) by Comer Homes. Despite significant opposition to the original plans by hundreds of local residents and without keeping residents informed the council march on with their close colleagues at Comer Homes and friendly management consultants Capita. All parties have done a great job in NOT keeping the community informed. Barnet’s philosophy on consultation seems to be a tick box exercise - information regarding the development and planning process has been very difficult to find and decipher, with residents not informed of a key event and decision. As a lay person it seems Barnet want to intentionally exclude the public’s involvement and right comment in order to push through this development with minimal intrusion. Whilst we accept progress and understand the need for additional housing in the borough there is a way of doing so without so many controversial measures. The plans for the NLBP are a complete contradiction to previous Conservative views. Proposing residential Tower blocks at a time where most have or are being brought down in London is nonsensical. The independent charity Policy Exchange clearly advised Councils and Government back in 2013 that, "High-rise blocks should be knocked down and replaced with terraced homes to help tackle social problems and remove 'no-go' areas"
"The report by Policy Exchange claims terraced streets and low-rise flats could achieve the same density of housing as high rise." How much of the housing will be affordable or in sustainable areas with a quality of life? This is currently a brown field site which has had some recreational playing fields yet the proposal is to turn the site in to a housing estate with a disproportionate amount of high rise buildings. It’s should not just be about building homes but also what they look like and the surroundings they exist in but this type of outlook only appears in developer’s brochures. In reality the Developers in this case Comer Homes are looking to maximise their return from the land they purchased many years ago and it is the Councils role, elected by the people for the people to ensure that developers don’t get the best return on their investment but that the local community get the best additions to housing and services in their borough. A good example of where this is NOT happening is at the North end of the NLBP site where plans are being agreed in outline to allow Emergency and Pedestrian access to the site via Ashbourne Ave / Weirdale Ave. Now this access point has been closed / restricted for generations. The only access ever allowed was pedestrian access for those who worked on the site many years ago via a manned gate. Since then the number of cars in the area has increased significantly and whilst the roads continue to be relatively quiet compared to main thoroughfares the sheer number of vehicles has forced many residents to invest in off street parking. Whilst this has helped the fact remains that most days and especially at weekends and evenings it is a difficult road to navigate with parked cars everywhere. So the idea of emergency vehicles plus additional cars parking in Ashbourne Ave / Weirdale Ave so that people can use the pedestrian access as a short cut is a ridiculous and dangerous suggestion and NOT in the current residents/ public’s interest and only in the interest of the developer. There is a reasonable assumption that the Council should always remain completely independent. 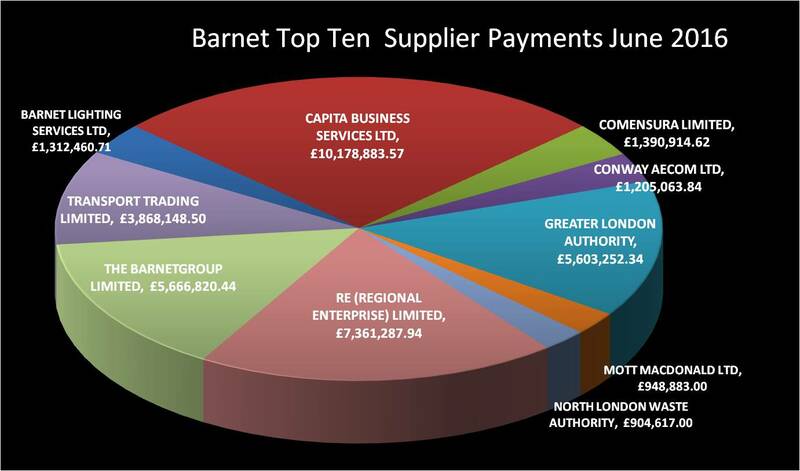 In Barnet there is a strong opinion amongst many residents that there is an unhealthy and not in the public interest relationship that has developed between Barnet Council, the Developer Comer Homes and the Consultants Capita. This relationship needs to be independently investigated before the NLBP plans are considered further. There is a significant conflict of interest between the three parties who share office space at the NLBP, in fact it is my understanding that Comer are the Councils landlords currently on the NLBP site. The Residents associations won’t go quietly and are prepared to turn to the law if necessary to ensure that the development of the site is in the best interest of the people living in the vicinity of the NLBP. The residents surrounding the NLBP are tired of being pushed around by the council who are happy to trade with developers as if there is no impact to local residents. The Conservative MP said: “I will fight these plans. I accept the need for new homes but eight storey blocks of flats are completely unacceptable. “That kind of development would be wholly out of character with the local area; it would disrupt traffic; and put real pressure on local services. If housing is to be built on this site, it must be far less dense in order to avoid impacting on surrounding streets. “I also strongly oppose any proposed access through Weirdale or Ashbourne Avenue, Villiers, as well as Councilor Lisa Rutter, have demanded urgent meetings with the council and developers to set out their strong oppositions to the plans."